Can Home-grown Quick Heal Challenge Global Brands In IT Security Market? The IT security solutions market is dominated by international brands such as Symantec, Trend Micro, McAfee and AVG who are in a neck-to-neck fight to capture a slice of the security software market in India. Amid them, there is a home-grown company, the Pune-based Quick Heal Technologies Pvt Ltd, which has found its niche in the fast-growing small and medium enterprises segment, by serving affordable security solutions. Today, Quick Heal sells 2.25 lakh licences per month in India and 20,000-25,000 licences internationally. Some of the products recently launched by the company include protection for Windows Mail Server, Microsoft Exchange and various other mail servers on Linux. Quick Heal recorded Rs 100 crore in revenues last fiscal, and is expecting the sales to grow by 40-50 per cent in 2011-12, say the company officials. The market for anti-virus software in India is worth Rs 400-Rs 450 crore in 2011 and Quick Heal claims to have a market share of 30 per cent in terms of revenues. Not a mean achievement, if you keep in mind that currently, the top anti-virus companies in India happen to be big brands like Symantec, Trend Micro and McAfee. According to Gartner, the total security software market in India will touch $209 million by the end of this year, growing at 12 per cent year on year. Therefore, the growth potentials can be tremendous, if the Indian firm manages to live up to the promise. Quick Heal was founded in 1991 by Kailash Katkar and his brother Sanjay. 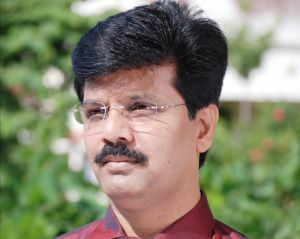 The company was initially called CAT Computer Services Pvt Ltd. Kailash Katkar started his career by repairing radios, TVs and VCRs, and also worked as a maintenance engineer with a company which installed ledger posting machines in banks in Pune, before he took the plunge and became an entrepreneur. The initial years were rough. There were times when the brothers mulled shutting down Quick Heal. But fortunately, they didn't. And things did get better for the firm over the past decade. Sanjay Katkar, who is now the chief technical officer (CTO) and technical director of Quick Heal Technologies, built the company's scanning engine for anti-viruses. They released their first product Quick Heal AntiVirus for DOS in 1994 and for Windows 95 in 1996. Last year, Quick Heal raised Rs 60 crore from blue chip venture capital firm Sequoia Capital India, in order to scale up its sales and support teams. When international brands are mainly tracking big corporate houses, Quick Heal is focusing on small and medium enterprises (SMEs) and the consumer segment, and believes that its service sets it apart. "We are extremely domain-specific and do not want to target all customer segments. We know where to focus and where not to tread," explained Katkar. Quick Heal is now working towards expanding its range of security products for the SME segment, especially in the education, health and manufacturing sectors. According to Matthew Cheung, principal analyst with the Gartner Technology and Service Provider Research group, smaller enterprises are steadily adopting higher levels of security measures. "Small Indian enterprises typically look for basic security measures such as antivirus, anti-spam and firewall, but now both small and large Indian enterprises are adopting more Internet and network security measures. Small companies may not be able to afford expensive expertise but are attempting to adopt such solutions," explained Cheung. Sequoia Capital, a leading venture capital fund, had decided to bet on Quick Heal. The decision was taken after considering the rising demand in the domestic market, as well as the focus on mobile phone security at Quick Heal. On how the company was positioned in the market, Shailendra Singh, managing director of Sequoia Capital India opined, "It has a very defensible market position. As one of the largest domestic security software product companies, Quick Heal has a strong market position." Sequoia Capital is now aiding the company file an IPO in the next 12 months. Sequoia is also attempting to make two other portfolio companies public â€“ local search engine JustDial and mobile handset-maker Micromax. Katkar, however, did not elaborate on his IPO plans. "We have left the IPO decision to Sequoia. Since Sequoia has invested in this company, it should take the call on the IPO exit route," he added. Quick Heal is betting on its PC2Mobile Scan feature to draw clients, who are aware of the need for security when it comes to extensive use of mobile devices. PC2Mobile Scan helps users scan, detect and delete malware, spyware and viruses on mobile phones. Lead analysts Kamal Vohra and Sandeep Sharma at the market research and advisory firm CyberMedia Research India proffer that the mobility of employees has brought to the forefront the need to ensure seamless and continuous operations, as well as data protection, and vendors are starting to take notice of this requirement. The company already has a mobile app for Windows Mobile-based smartphones and it is now looking to develop more security apps for other devices like the tablets. Quick Heal also plans to launch Unified Threat Management (UTM) security appliances in May this year. But it is yet to be seen how Quick Heal will fare in the low-cost UTM market, considering that various vendors offer scaled down versions of their products. According to CyberMedia Research India, the UTM segment is getting very competitive as modular solutions are also available to cater to the requirements of the price- and resource-sensitive Indian SMB segment are also available. On being asked if the decision to enter the market has been taken too late, Katkar replied, "We think that the market is yet to be explored and there is a lot of potential." In India, the education segment has adopted UTM solutions fast and this is a sector the company is keen to target. Quick Heal not only faces the challenge of diverse products in comparison with larger, more mature international players, but also that of quality, warn industry experts. "International security vendors are far ahead of domestic companies when it comes to technology. We cannot say they are inventing software applications," says Cheung. Gaurav Kanwal, country sales manager (India) of consumer products and solutions at Symantec â€“ another security vendor and a competitor of Quick Heal â€“ said, "Given today's threat landscape, antivirus alone is not enough; consumers need firewall, intrusion protection, Web browser protection, anti-spam, identity safeguards and the latest reputation-based security to keep their data safe. So, vendors have to offer complete protection to their customers." Anuj Gupta, sales director of Miel E-Security, a Mumbai-based security solutions provider, feels that global brands have an edge over their Indian counterparts such as Quick Heal because of their product quality. "Companies like Quick Heal who claim to have the best quality security software, have to make sure that they can fulfil the holistic security needs of clients. Internet security is no longer limited to anti-virus applications. Especially in this era of cloud computing, domestic security vendors must be able to offer an entire range of reliable security solutions, as the international brands do," said Gupta. Cheung adds that Quick Heal also has to be more concerned about the execution of its mobile security software. "The mobile space is a fast-growing one and the company should concentrate more on its mobile products, rather than software security. Quick Heal should partner with mobile handset manufacturers and telecom operators to increase its presence in the domestic market," he advises. But the company seems to be on the right track and even the surprise acquisition of McAfee by chipmaker Intel for $7.68 billion late last year has not affected Quick Heal. According to Katkar, there was no negative impact on sales. McAfee currently operates as a wholly owned subsidiary, reporting to Intel's Software and Services Group. The company has doubled the strength of its call centre, which now employs 60 people. "We are looking to ramp up the facility through technology acquisitions, talent hunt and retaining its focus on product lines," said Katkar. Katkar continues to build up the distribution network and deliver stocks in time for his business clients. "We are focusing on developing our logistics, so that all desktop products are available ex-stock at most locations and enterprise products are available within 24 hours," he explained. Quick Heal relies on its system integrator partners to reach more clients. "Our system integrators have a better understanding of which products should be deployed to which areas," said Katkar. He added that the company was lagging behind in the South zone due to a late start. Meanwhile, Quick Heal will ramp up its products and market reach this year, and is targeting revenues of Rs 400-450 crore over the next three years.